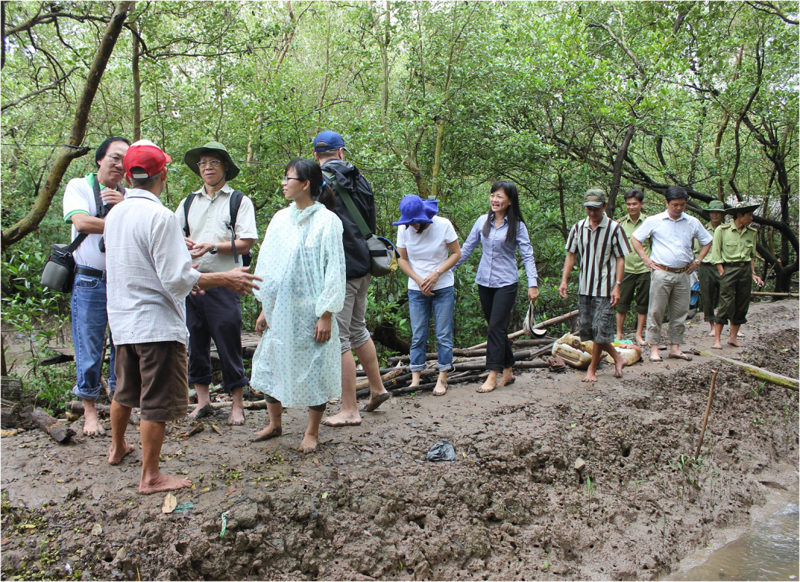 On July 06th and 07th 2016, a delegation from Royal Norwegian Embassy and UN-REDD+ Vietnam Phase II Programme led by Mr. Eirik Brun Sorlie, a Counsellor of Royal Norwegian Embassy in Ha Noi, inspected ongoing activities in Tam Giang I Protection Forest Management Board (PFMB) and visited a model of Mollusca (Cerithidea obtusa) farming under forest canopy in Bien Tay Protection Forest Ranger Department (PFRD). The delegation visited a model of aquaculture integrated with forest protection and management and consults local people in the area where the programme has been implemented. The delegation appreciates Tam Giang I PFMB's efforts in patrolling, protecting, and managing coastal protection forest. Proposals of Tam Giang I PFMB include: to equip office supplies as well as transport means for forest patrol, protection and management; to facilitate implementation of livelihood activities, especially to provide aquatic breeds seasonally in time. All the proposals have been acknowledged and implemented at the soonest possible time.